Rumors of mass immigration enforcement actions in the Bay Area spurred San Francisco police commissioners to reiterate Wednesday night that local officers are barred by state and local law from helping U.S. Immigration and Customs Enforcement agents round up suspected undocumented immigrants. Commissioner Petra DeJesus asked the City Attorney's Office for guidance on what can be done to stop ICE agents from wearing jackets that say "Police," and sometimes representing themselves as local law enforcement. Those tactics and attire can hinder local policing, DeJesus said. "They shouldn't be calling themselves police," DeJesus said at a Wednesday night commission meeting. "They’re federal agents." DeJesus said she wants to send federal authorities a "cease-and-desist letter to tell them to stop imitating police officers in the state of California and put federal agents on their jackets." It's not a new concern. In fact, state legislators passed a law last year citing "concerning" tactics used by immigration agents and declaring that ICE and Customs and Border Protection agents are not recognized as California peace officers. But the Assembly Bill 1440's author, Ash Kalra of San Jose, acknowledged before the bill became law that it is likely unenforceable. "Recognizing that federal law preempts state law, this bill may be viewed as symbolic," Kalra wrote in a state Assembly analysis of the bill last summer. "However, as California and the rest of the nation enter into a new reality of aggressive and, at times, deceitful actions undertaken to enforce immigration actions, California must take any and all necessary actions to disassociate the actions of federal ICE agents with those of licensed state and local peace officers." 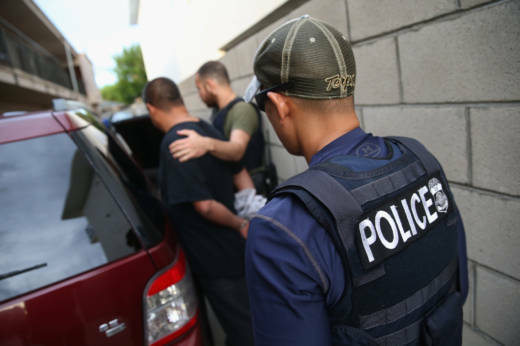 Of greater concern than the words adorning ICE agents' jackets, according to immigrant advocacy groups, is the use of "ruses" in which agents try to get voluntary consent to enter homes without a warrant by representing themselves as police officers. "ICE permits its agents to misrepresent themselves as police officers, probation officers, religious workers and other officials to gain community members’ permission to enter homes without warrants," the ACLU of Southern California wrote about the issue last year. "The ruse has also been used to get individuals to volunteer information they might not otherwise divulge." A coalition of New York-based organizations, including the Center for Constitutional Rights and Immigrant Defense Project, has published a series of ICE manuals, memos and training documents obtained through a Freedom of Information Act lawsuit. The documents show agents are trained that they can represent themselves as police officers and other officials when seeking consent to enter a home. "Ruses can run the gamut from announcing that you are with DRO and looking for a person other than the target to adopting the guise of another agency (federal, state or local) or that of a private agency," an August 2005 ICE memo that's cited in later guidance says. The memo says agents must seek permission from the agency or business they plan to impersonate, but there's no guarantee they won't go through with their plans over any objections. "The HQ/FOU will weigh the affected agency or entity’s equities or concerns against the well-known and inherent advantages that a ruse offers," the memo says. "It is our intention to use whatever means available to ensure that officer, target and innocent third party safety is not compromised." An undated ICE fugitive operations training slideshow encourages agents to “IDENTIFY YOURSELF AS ‘POLICE’ or ‘Federal Officers’ (DO NOT identify yourself as with a specific police department)" and to "ASK FOR CONSENT TO ENTER AND Look Around (avoid the word 'search')." San Francisco Police Commissioner Thomas Mazzucco joined DeJesus' concerns Wednesday night about ICE agents being perceived as SFPD officers. He said he'd heard about San Francisco officers making immigration arrests from a member of his church. "I asked afterwards and it was ICE agents wearing jackets that said 'police,' " Mazzucco said. "The jackets probably should say ‘federal agent’ and not ‘police.’ That’s an issue for the safety of the officers and the agents, too." The San Francisco City Attorney's Office declined to comment on any guidance it may give the commission, citing attorney-client privilege. "We encourage San Francisco residents to contact the City Attorney's Office or the San Francisco Police Department if an ICE agent misrepresents themself as a San Francisco police officer," spokesman John Coté said.